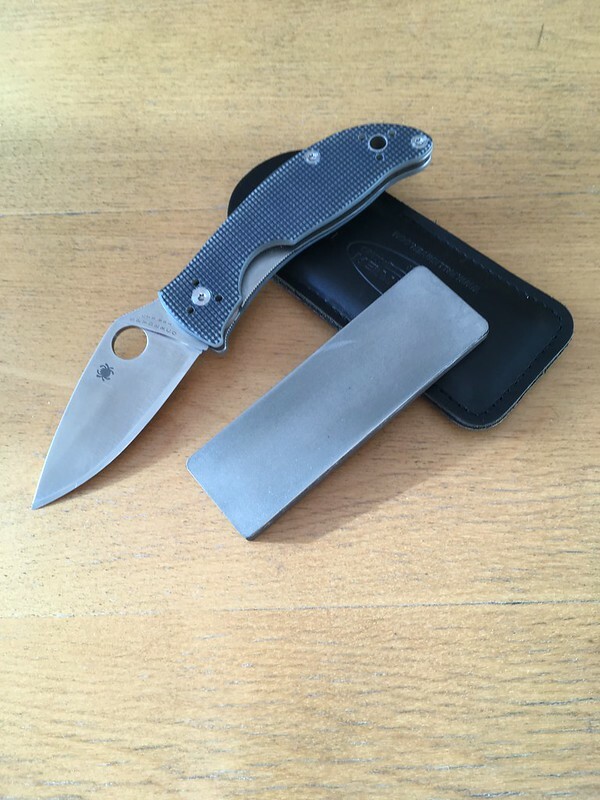 At the end of the 2017 Spyderco meet in Amsterdam we received the Spyderco Polestar. A year later, at the the 2018 edition of this event, we were presented with its smaller brother the Alcyone. Nemo gave his example to Pascal who wrote and excellent review of the name of the knife, and his experiences with the it during his use. Here I will present my experiences with this knife. I have reviewed the Polestar before. As the Alcyone and the Polestar are made of the same material and share many features, here I will focus on the things that I noticed to be different. To start with the biggest and most obvious difference: the size! The Alcyone comes with a 7,4cm (2,9inch) blade where the Polestar’s is 8,4cm (3,3inc). This makes it more edc friendly for me. I have carried it in the waistband comfortably for a month at the moment of writing. 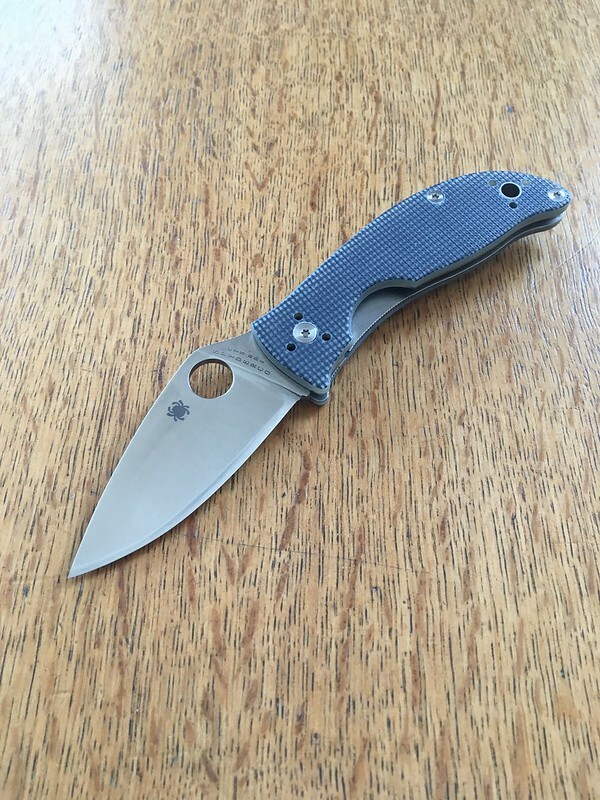 The design is quintessential Spyderco. Put is next to other knives that have been designed by Spyderco’s founder Sal Glesser, and the family resemblance is unmistakeable. Sal puts a lot of attention into designing knives that work great in the hand, and he definitely succeeded with the design of the Alcyone. It feels pleasant in the hand and offers a lot of control while cutting. Both in normal edge-out as well as edge-in grips, like when you are pealing something. Good stuff! New the edge on my example was not very good. It could not push cut receipt paper and only slice it with difficulty. So it needed to be resharpened before I could carry and use it. The edge was also thicker that I liked. Edges on new production knives often are. (Though overall the edges on new Spyderco’s have become a lot better at this in recent years.) So I took out the well used extra course DMT Diamond hone and set to work. After the thinning I refined it on the diamond side on the Fallkniven DC4. I was not hard to put a head hair splitting edge on the knife this way. Now it cuts very well! In use the BD1 steel blade has proven to hold and edge well and be easy to keep sharp. The Alcyone had a noticeably stiffer action out on the box than the Polestar. The Polestar could be middle-finger-flicked from the get-go, not so the Alcyone. Opening the blade with the thump though was easy to do. Putting a little nano oil on the pivot and the detent ball made it a little smoother. The biggest difference though was made when I unscrewed and re-tightened the pivot and handle screws. After I did that the knife became noticeably smoother and it became possible to middle-finger-flick the knife. Which is a lot of fun! 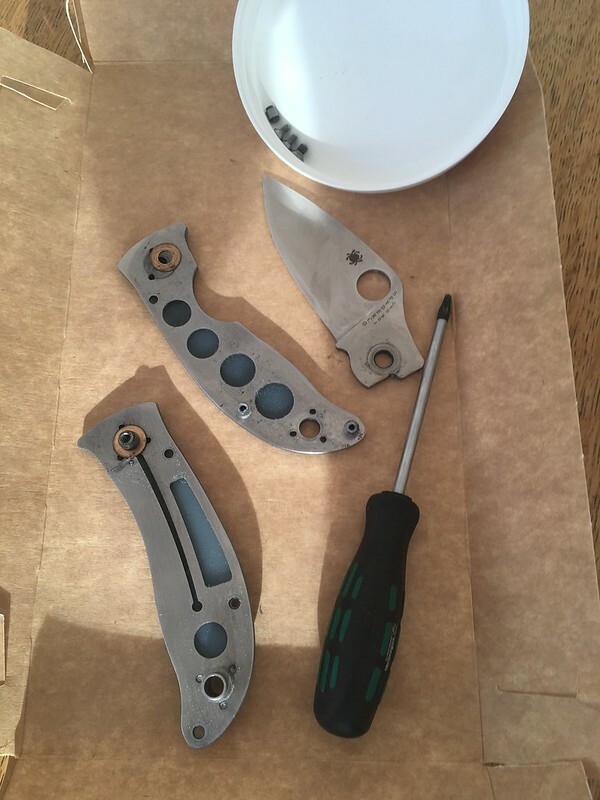 I also took the knife apart. Not something I often do but I was curious to see what for a effect it would have on the smoothness, and how difficult it would be to do. It proved to be an easy operation but did not have more effect on the smoothness than releasing and re-tightening the screws had had. The Alcyone has proven to be and excellent edc in the month that I carried and used it. A great design that just needed a little t.l.c. to shine at its full brightness! Very interesting to see it dismantled and to have a expert sharpener feedback. All the best to you JD! 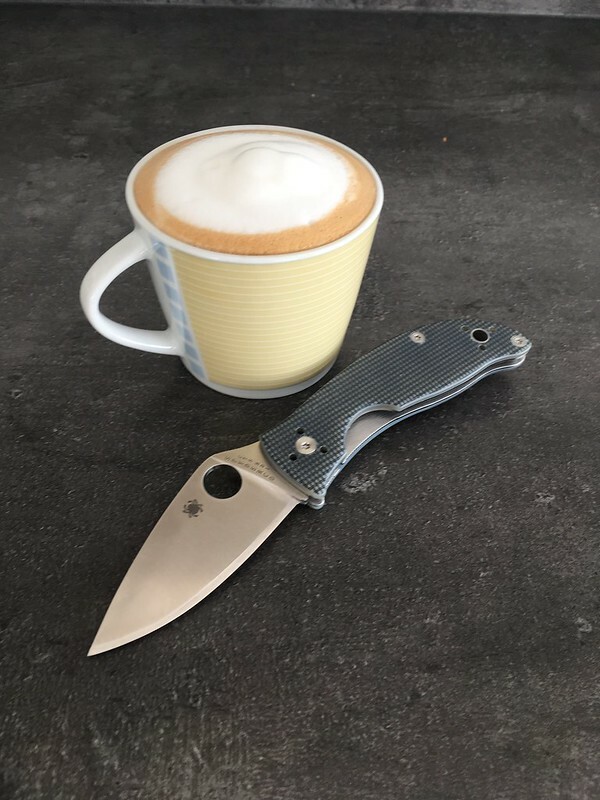 Previous Previous post: Self Defense in the kitchen with the Jade Yojimbo2!